Global TV News story on Dorothy link is LIVE! Just one month until our Indiegogo production funding campaign begins! More on that in next week’s post… because right now there’s a lot of exciting news to share. 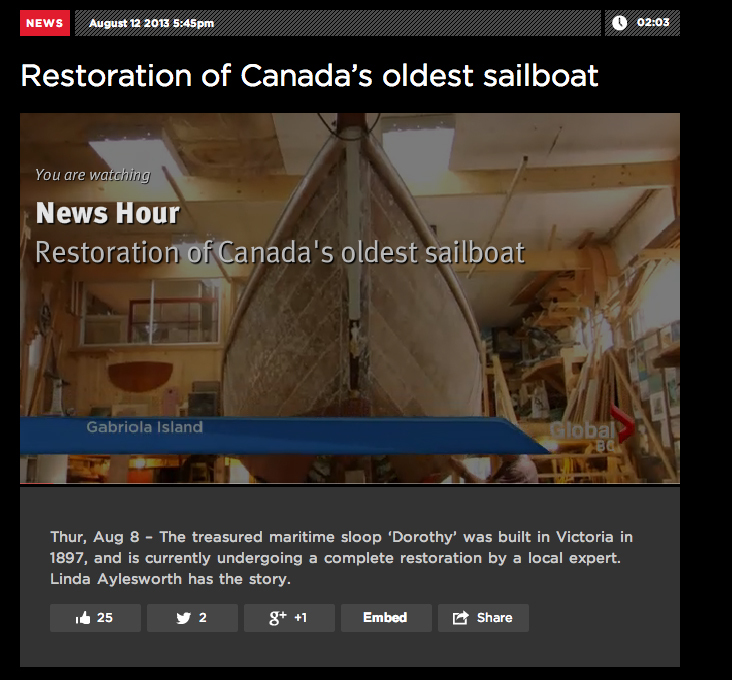 Last week saw a lot of press for Dorothy with both Global TV News and CBC Radio covering the restoration of this little gem of maritime history. In a stroke of terrible lack of foresight, neither Tony Grove – the wooden boat builder tasked by the Maritime Museum of BC with the restoration project – or I got to see the news piece but now it’s online. So here’s the link: GLOBAL DOROTHY STORY. Please share around, put it on your Facebook pages, and tell your friends about it. Also please LIKE our Dorothy Documentary page as well! Annnndd… more great news… Victoria’s Times Colonist is working on a major article about Dorothy right now, and I believe it will come out in tomorrow’s (Friday) paper. They said the article should have a prominent spot because there are lots of great photos (both Tony and Dorothy being rather pretty, as most will agree after watching the clip) so that is JUST AWESOME. I’m heartened by all this great press and incredibly thankful for it, because it’s causing people to think about Dorothy as not just a relic of history, but as a contemporary story that can move hearts and minds. It’s bringing the global community of boat lovers and storytellers together — which is exactly what we need to make this documentary a reality. We’re getting so much great feedback: “So happy you’re doing the doc. It’s great to have this local story being shared”, “Love the up-dates… one kind of feels a part of something amazing this way,” and so many people writing to say they can’t wait for the documentary, they want a Dorothy t-shirt or to make a donation, that I know we are on the right track. If YOU believe in us and are helping us, we can make this important historical documentary an extraordinary story that will be seen around the world. On Monday, I’ll write about how we’re going to use the power of community and the social fundraising website Indiegogo to help fund the production, and how you can help. Meantime, share the video around, and keep an eye out for that article in the Victoria Times Colonist.